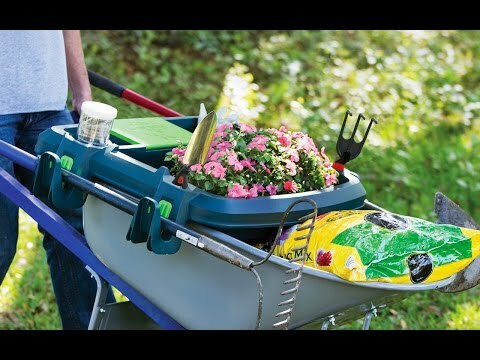 Double-deck your ride with this wheelbarrow organizer and carry all your essentials in a single, tidy trip. Arrive armed with a drink in a coaster, your phone in a compartment, and your small and long-handled tools secured in place. Who knew wheelbarrows could look this neat? Dimensions: 31" x 16" x 5"
Clip this wheelbarrow organizer on and carry all your essentials in a single trip. Little Burros makes yard work easier to plan and execute. It sits atop your barrow, providing slots for everything you’ll need to garden, clean up, and spend the day outside. It fits gloves, tools, seeds . . . and even has a designated spot for a five gallon bucket. And to keep you connected while hard at work, there’s a roofed compartment for your phone. After Maker Bob Thompson spent the day going back and forth from the garden to the shed, he came up with the first prototype. It’s not supposed to replace your wheelbarrow, but enhance and multiply its functionality—stealing only two inches from the standard storage space and adding compartments where they didn’t exist. This all-terrain addition is made from a UV-resistant material that won’t fade in the sun and grips firmly so it stays attached as you tilt and turn. Clip and equip to see what an organized wheelbarrow looks like.